Read The Saxon Times and follow all the tumultuous events of 1066 and the Norman Conquest. No one from the English Church or The Abbey of West Minster was available for comment but I was able to interview the monk Eilmer of Malmesbury. Dismissed as mad by those around, his comments were overheard by some close to the King. They did appear concerned, even worried and after some discussion decided to let the King know of Eilmer’s doom laden speech. What will happen now to Eilmer I’m not sure but the general advice was that he should get back to the safety of Malmesbury as quickly as he could. For the full report behind these headlines and the reports, read 1066 The Saxon Times and experience the Norman Conquest through the eyes of the Saxon Times reporters. Pilgrims from overseas, who have visited Winchester to sit at the tomb of St Swithun, have revealed some extraordinary tales from mysterious eastern lands. Discounted by clergy as the work of the devil, it appears possible to create books many times over in “a blink of the eye”’ according to one report, and “without the use of pens”. I catch up with one of the pilgrims, Brother Osmund, and whilst he confirms the rumours he admits that the story is at least third hand. He heard it from a friend of a friend of a friend, so to speak, who had ventured east by boat from Byzantium. Brother Osmund recounts this tale. “In a land far away to the east, beyond belief, there is a world that has invented the ability to produce many copies of the same book. This country is known as China and they have called what they do ‘Printing’. “They’ve printed many copies of their religious writings, 5000 scrolls each. Just think what we could do with the Bible. If people could read, they could read the Bible themselves. It would be a whole new world. We could spread the word far and wide. Everybody will share in the Holy Trinity”. The Saxon Times King’s Games have been devised to give an idea of the timescales for the major events of that tumultuous year, 1066, in a fun and entertaining format. They present the story of 1066 as a board game from the Death of King Edward the Confessor, the coronation of King Harold II, preparation for war to the Battle of Hastings. King William’s game includes his progress through southern England to his coronation on 25th December 1066. They are ideal activities to introduce the concept of 1066, reinforce learning and/or as an end of term activity. Each game is an A3 size pdf. file and will be e-mailed to you on proof of purchase. The King’s Games are also available through TES. Tne Saxon Times is available as individual A3 posters to record the events of 1066 through the eyes of The Saxon Times reporters. They aim to inspire curiosity to know more about 1066 and expand and develop knowledge and understanding of Britain’s past. Each issue reports the major headlines of the day with comment, advertisements and maps as appropriate. 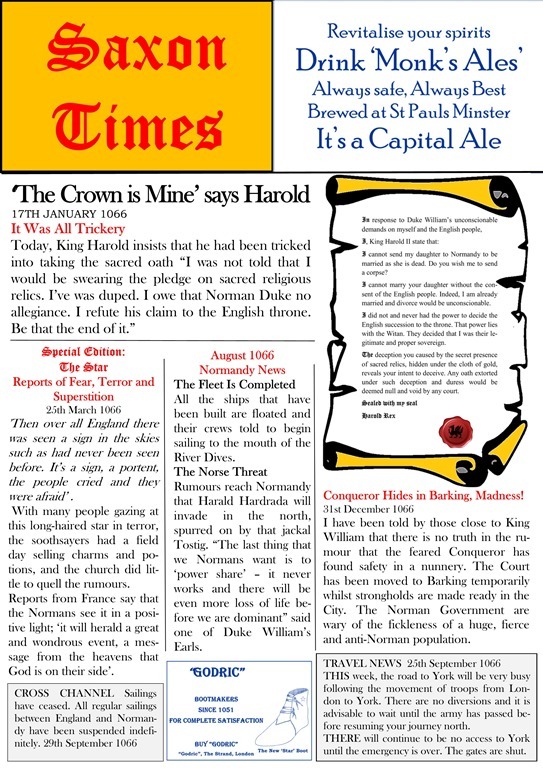 The Saxon Times posters are also available through TES. The Saxon Times seeks to provide that important newspaper’s view of 1066. The Saxon Times was written to bring 1066 alive with the stories behind the headlines, ‘eye witness reports’ that explores life in 1066. ‘I would like to thank my good friend William of Poitiers for all his help and support in writing this newspaper, he was a valuable source of information and privy to most of the decisions of Duke William himself. William of Jumièges also proved to be a reasonably reliable source although he was limited in his capacity to travel because of his great age. Our discussions about the events of the day and their jottings and scribblings served me well when it came to write up my copy. I wish them both every success when they both come to write up their books on ‘The Deeds of Duke William’. Despite keeping ‘immaculate’ records for both King Harold and Duke William there is occasionally some confusion as to the actual day or dates when these tumultuous events occurred. Everybody seemed to work to a different calendar and sometimes there was a discrepancy or difference of opinion for which I apologise. Even the best of us can forget which day it is! I must also thank my colleagues who followed the campaigns of King Harold and Duke William, sometimes in great personal danger. Alfgar of Peterborough and Eadgar of West Minster were given leave of absence from their monasteries to record the events of 1066 for posterity. Eadgar became Court Correspondent and Alfgar followed the northern campaigns before we all joined up together at the Battle of Senlac Hill. 1066 is the stuff of legends and uncorroborated tales which allow a story to be woven as a best guess or a more than likely scenario. There are only a few dates that than can be conformed categorically and often there is a discrepancy or a difference of opinion and sometimes pure conjecture as to when the events happened and I have attempted to draw together a timescale that meets the facts and the logistics of moving armies around Saxon England. The main problem is that the two main chroniclers, William of Poitiers and William of Jumièges, both wrote their respective ‘books’ some years after 1066. The bulk of the writing of William of Poitiers’ ‘Gesta Guillelmi’ probably took place between 1071 and 1077 and William of Jumièges’ Gesta Normannorum Ducum (Deeds of the Dukes of the Normans) was most likely finished in the year of his death in 1070. With no internet access, dictaphones, laptops or tablets it is unsurprising that the dates may be out. The Saxon Times is a compilation of the available historical information from a wide variety of sources that include relevant books, magazines, journals, television, radio and of course the internet. Where dates cannot be pinpointed accurately, they have been included as summary of events that provide some historical context to 1066. I must thank the eminent historians and scholars whose books provided much of the detail for The Saxon Times and the Medievalist.net, and all their contributors, whose valuable research provided background reading for additional news items. There is more to that tumultuous year than the political intrigues and family betrayals that led to the Battle of Hastings and so beloved of television productions. The Battles of Fulford, Stamford Bridge and Hastings, between Vikings, Anglo-Saxons and Normans, are the stuff that every student knows. King Harold’s epic marches are part of our folklore and can be read in any history book. Old facts dressed up as new facts, revelations and interpretations that serve to create a vision of an official history are unchallenged. despite the many pages written that create a far more accurate picture of history. But there is much more to history than ‘the bigger picture’ and The Saxon Times seeks to provide that important newspaper’s view of 1066.